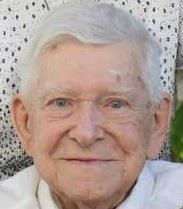 Joseph George Rickwalder, 95, of Mesa Arizona passed away peacefully on Wednesday, January 3, 2018. Known to friends and family as “Ricky” he led a very happy, active life filled with family, friends, laughter and love. He served oversea in the Army/Air Corp during WWII and was later stationed in Washington D.C., where he had the distinct honor to serve as a guard at the Tomb of the Un-Known Soldier, for which he was very proud. After serving his country he married his true love Theresa in 1945 and they were blessed to share 72 wonderful years together. Joseph worked for Western Electric, which later became part of the Bell Telephone system, retiring in 1980. At that time he and Theresa relocated to Arizona where he was able to pursue his passion for golf year round. His friends and family describe him as a wonderful compassionate man, a fantastic father to his beloved children who loved life and always had a twinkle in his eye. His quick wit and great sense of humor, along with his tenacity and strength will be remembered by all. Preceding Joseph in death were his brothers John and Thomas and sister Mary. His children Richard, Jean Marie, Theresa, Marian, and Elizabeth Ann; Grandson, Paul Joseph and great grandson Hayden. Surviving are his wife of 72 years Theresa and children Diane, Joseph, and Regina; grandchildren Bernie, Dawn, Darlene, Kimberly, Christopher and Glenn; Great grandchildren Kaitlyn, Cincere, Taylor, Morgan, Caitlin, Allyson, Natalie, and great-great granddaughter Addison. Mass of Christian Burial will be held at 10:00 am on Thursday, January 11, 2018 at All Saints Catholic Church, 1534 N. Recker Road in Mesa Az. Interment will take place at 11:30 am at Queen of Heaven Cemetery, 1562 E. Baseline Road, Mesa, Arizona. In honoring his great love of children, In lieu of flowers donations to St. Jude Children Research Hospital, 501 St. Jude Place, Memphis, Tennessee would be greatly appreciated. Was an honor to meet at your home to take your loved one into our special care Wednesday afternoon. So inspired by his life of service & thoroughly enjoyed meeting Theresa & the girls. Please know you have all been in my heart as I continue to pray for your peace during this difficult time. Blessings & much love extended to the Rickwalder Family & friends. My mother, sister and I cannot thank you and David enough for the beautiful, digified and repsectful way that you cared for our father. The manner in which you presentetd him to us with the US Flag drgped over him and the white roses allowed us the opportunity to have a beautiful last memory of our beloved father. He was a fantastic man and he was treated in the manner in which he deserved. You assisted in making a very diffiult and painful moment easier to bear. Thank you from the bottom of our hearts. Regina and Family, for years now through my friendship with Regina, I have heard the funny stories and about the twinkle in his eye. I only met him once but I know how he loved his family because it was returned to him in how much he was loved. My sincerest condolences, praying for comfort and strength for all of you.